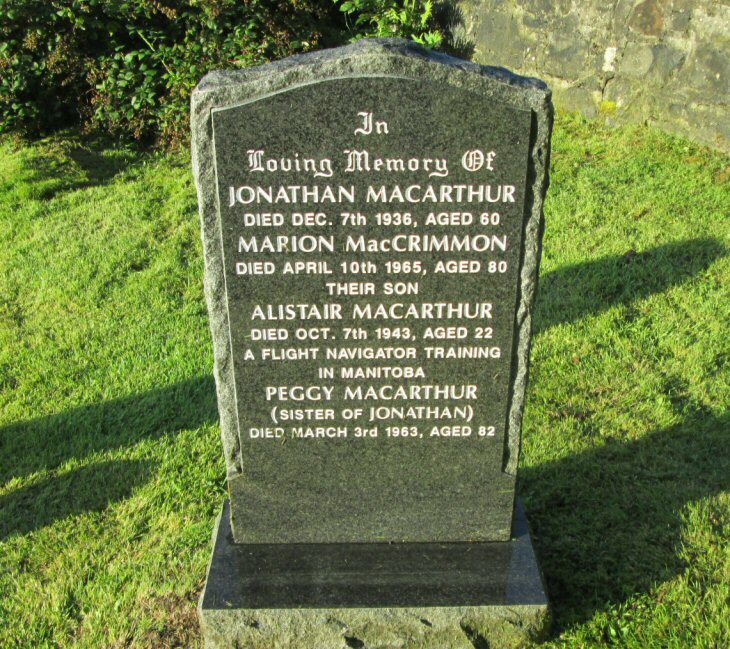 Skye Gravestones | Jonathan & Marion (MacCrimmon) Macrathur & family. Jonathan & Marion (MacCrimmon) Macrathur & family. In/loving memory of/JONATHAN MACARTHUR/died Dec. 7th 1936 aged 60/MARION MacCRIMMON/died April 10th 1965 aged 80/their son/ALISTAIR MACARTHUR/did Oct. 7th 1943 aged 22/a flight navigator training/in Manitoba/PEGGY MACARTHUR/(sister of JONATHAN/died March 3rd 1963, aged 82.